Stephanie Mills is the Client Service Manager for Hudson Pride Connections Center. She provides leadership in the development, planning, and implementation of HPCC’s Outreach and Linkage to Care Program and the Center’s youth program, YouthConnect. Stephanie oversees all of the weekly support groups and programs at Hudson Pride. She manages our team of Outreach Associates, which provides Hudson County residents with information about HIV/AIDS, helps them get tested to determine their status, and — if found to be positive— works with them to get them linked to medical care, as well as with a variety of other care services that our Center supports. YouthConnect is our youth program geared towards LGBTQA youth ages 13-24. This group meets every Friday from 6 to 8pm. Stephanie manages this program and the staff, interns, and volunteers who work specifically with the youth. She also works regularly with existing or potential clients to determine their needs, works on a plan of action for obtaining their goals, and advocates on their behalf within the community. She has built strong partnerships with youth or youth-supporting organizations to create better opportunities, events, and relationships in our community. 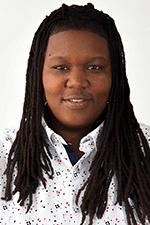 One of her main focuses is advocating for LGBTQA youth, outreaching to or working with other organizations and schools in the area. Stephanie graduated from William Paterson University in 2010, earning her B.A. in English. She served as an Americorps member, mentoring and coordinating programs for high school students as well as serving as the Program Director for then-Mayor Corey Booker’s “Brick City Serves” initiative, where she was an advocate for low-income families. She worked closely with Newark Public Schools, various nonprofit organizations, and social services leaders to bridge community needs with effective resources. Since joining the HPCC team in 2011, she has established a role on the Hudson County Alliance to End Homelessness committee and has contributed tremendous outreach efforts to eliminate homelessness in our community. Her overall goal is to empower clients to become engaged in creating positive change for themselves and ultimately their communities.